Five steps that worked for me. My students, like students everywhere, are smart and funny and creative and wonderful in so many ways. Also like students everywhere, they constantly seem to be looking for shortcuts on their homework. One of the bus drivers told me last year that the kids openly ask her to turn the interior lights on so they can finish copying homework before they get to school! Sigh. At least they’re motivated enough to copy, right? This year, I made it a major goal to stop students from cheating. 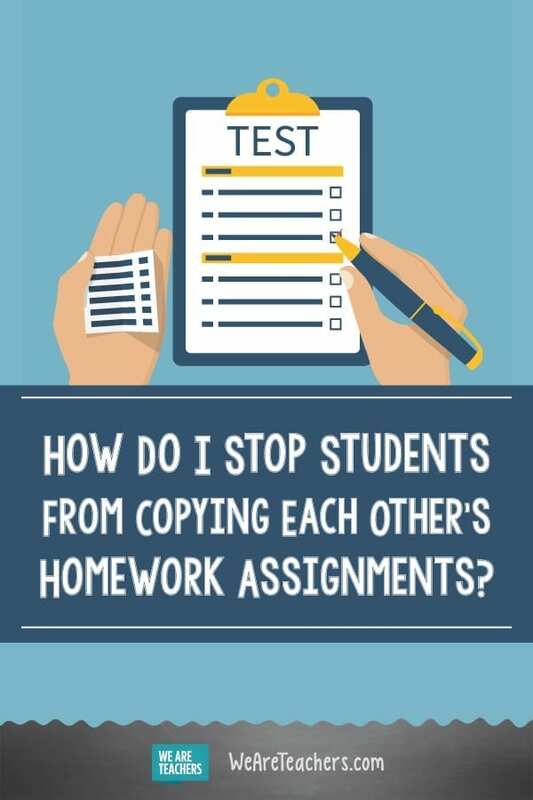 I put this five-step process in place, and it really cut down on the homework copying in my classroom. Here it is. Step 1: Check the quality of your assignments. First of all, it’s worth taking a close look at the kind of homework you assign. If you do a lot of worksheets, you might find those work better for in-class activities. Instead, try focusing homework on in-depth writing assignments and individual written responses. If you’re a math teacher, having kids respond in writing about how they solved a problem always works, as does having them write their own problems or exemplars for what they’ve been learning. Anything that requires student-generated content is automatically going to be harder to copy. Step 2: Check the quantity. Of course, this creates a lot more grading than worksheets, which led me to reflect on the amount of homework I assigned. At first, I found myself overwhelmed. I had to wonder if this was how my students felt when they looked at a night’s homework load. If there had been someone whose grading I could have copied, I probably would have done it! The result? I assigned a lot less homework as the year went on. Put your homework to this test: If it’s not worth your time to grade carefully, it’s not worth the students’ time to do it. Step 3: Explain the changes. Once you’ve started assigning less homework, you’ll want to make your reasons explicit to your students. “I’m assigning less homework because I don’t want to waste your time. That means that anything I do assign is really important, and it’s important for you to actually do it on your own.” This speech went a long way with many of my students, but I had another trick up my sleeve. Step 4: Allow time to learn and make mistakes. You might also want to try a few get-out-of-jail-free cards when it comes to homework. My middle schoolers are still in the process of learning how to budget their time and stay organized, and sometimes they make mistakes. I gave each kid three one-day extensions that they could use over the course of the year to avoid a penalty for late homework. There were certain assignments on which these could not be used, like rough drafts we needed to edit or group projects. It lowered the general stress level and set a culture of respect and accountability that encouraged my kids to plan ahead. For the naysayers who say, “The real world won’t give them extensions,” I would respectfully offer my disagreement. What? You’ve never posted your grades after the deadline? Step 5: Bring the pain. Although this cut down on copying substantially, kids will always test your limits. That’s when you move on to the final step. It works like this: Read every word of every assignment. Make sure you grade an entire class at once so you’ll know if a phrase or a creatively spelled word seems familiar, and then hunt back through 35 other papers until you find the one it’s copied from. It is important that you identify when students cheat and that your justice is swift and merciless. I had an escalating system of consequences for cheating. First time, you split the grade. If the assignment gets a 90, each person gets a 45. Second time, each person gets a zero and a lunch detention. Third time, it’s a phone call home in addition to a zero and an after-school detention. Not a single kid made it to the third offense. They have to believe that you’re documenting this and you’ll follow through. Let them see you putting their names in your file so they know you know what offense they’re on. It is a logistical pain, but it’s effective. So did my kids ace the standardized test because they had done their homework all year? Not to brag, but their writing scores were pretty high. And I don’t think they missed out on many valuable educational experiences when I stopped assigning worksheets. After all, they’d have just copied them anyway! How do you stop students from cheating? Come and share in our WeAreTeachers HELPLINE group on Facebook. Plus, check out how to give meaningful homework, even when it’s not graded.